In this special two-part article, Benjamin Radford and John Gaeddert examine the truth behind two recent Hollywood ghost stories, The Amityville Horror and White Noise . The story of The Amityville Horror , as with The Exorcist , begins with a best-selling novel. 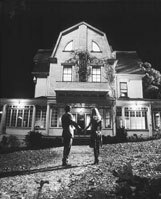 A book titled The Amityville Horror: A True Story , written by Jay Anson, was published in 1977 and quickly became a hit. Soon it was made into an equally successful horror film starring James Brolin and Margot Kidder. And, as with The Exorcist , several inferior sequels followed in its wake (including a 3-D version). The latest version is due out April 15. Anson was not a resident of the infamous possessed house, but a professional writer hired to pen a book based on “true events” that happened there several years earlier. . . . The story behind the story began on November 13, 1974, when six members of an Amityville, New York, family were killed. The parents, Ronald and Louise DeFeo, were shot in bed while they slept, along with two sons and two daughters. The sole remaining family member, Ronald Jr. (“Butch”), was arrested for the crime and later sentenced to prison. With the family dead (and Butch in no position to inherit the place), the house went up for sale. The horrific nature of the massacre unnerved the otherwise quiet Long Island neighborhood, though no supernatural activity was associated with the house at 112 Ocean Avenue. The following year, a new family, the Lutzes, moved into the house. George and Kathy Lutz, along with their three children, said that shortly after moving in, the six- bedroom abode became a hell house. It seemed that perhaps the demons that drove Butch to slaughter his family were not in his head but in the house. An unseen force ripped doors from hinges and slammed cabinets closed. Noxious green slime oozed from the ceilings. A biblical-scale swarm of insects attacked the family. A demonic face with glowing red eyes peered into their house at night, leaving cloven-hoofed footprints in the morning snow. A priest called upon to bless the house was driven back with painful blisters on his hands. And so on. Some people expressed doubts about the events in the house, and a few specific parts of it were even proven false. (For example, the Lutzes could not have found demonic hoofprints in the snow when they said they did, because weather records showed there had been no snowfall to leave prints in!) Still, the Lutzes stuck to their story, reaping tens of thousands of dollars from the book and film rights. The truth behind The Amityville Horror was finally revealed when Butch DeFeo’s lawyer, William Weber, admitted that he, along with the Lutzes, “created this horror story over many bottles of wine.” The house was never really haunted; the horrific experiences they had claimed were simply made up. While the Lutzes profited handsomely from their story, Weber had planned to use the haunting to gain a new trial for his client. The Lutzes also later admitted that virtually everything they had said about the haunting-and everything in The Amityville Horror -was pure fiction. Their account was likely influenced by another fictionalized story-that of The Exorcist . In fact, it is not much of a stretch to suggest that The Exorcist strongly influenced the Amityville story; The Exorcist came out in December 1973. Many of the myths surrounding The Exorcist film and “real story” came about because of “the mystic twaddle Blatty gave out to the press while pushing his book” (Kim Mohan quoted in his book Nightmare Movies , p. 43). Blatty had a career and book to promote, and was not above embellishing the story with partly (and wholly) fictional elements. Of course, the film was not a documentary, but Blatty strongly suggested that the film stuck more or less to reality. Demonic possession and hauntings were very much in the public’s mind when the Lutzes spun their stories of demonic activity a year or two later. The Lutzes must have had a good laugh at the expense of the mystery-mongering ghost hunters and self-proclaimed psychics, who reported their terrifying visions and verified the house’s (non-existent) demonic residents. Apparently, it was all their imaginations. To this day, the fact that The Amityville Horror story was an admitted hoax is still not widely known; as they say, the truth never stands in the way of a good story. Details for this article were taken from Joe Nickell’s fine investigative piece “Amityville: The Horror of It All,” in the January/February 2003 issue of Skeptical Inquirer magazine. See also Stephen and Roxanne Kaplan’s book The Amityville Horror Conspiracy and “The Amityville Horror Hoax” in the May 1978 Fate magazine by Rick Moran and Peter Jordan.